SHELVING pASS-ThRu ShELviNg Standard Pass-Thru Shelf • ”Hat Channel” Design Allows Shelf To Be Freely Positioned • Includes Wall Mounting Brackets For Securing Shelf To Desired Position All Pass-thru Shelving on this Page  Specialty Shelving = Ship Via UPS   Pass-Thru shown with Cantilever Brackets 18” WIDE PA-18-24 PA-18-36 PA-18-48 PA-18-60 PA-18-72 PA-18-84 PA-18-96 PA-18-108 PA-18-120 PA-18-132 PA-18-144 # of Length Brackets 2 2 2 2 2 3 3 3 3 • 1 CU Series Overshelf welded to a PA Series Pass-Thru shelf • 1-5/8” Stainless Steel Tubing • Shipped as Welded Set-Up Pre-Wiring Available! Contact our Smart Fab Department at smartfab@advancetabco.com 18” WIDE Price PA-18-48-2 $2575 Pass-Thru with CU Series Shelf & Cantilever Bracket Shown 24” WIDE Price PA-24-48-2 $3252 # of Length Brackets 48” 2 60” 2 72” 2 84” 3 96” 3 108” 3 120” 3 132” 4 144” 4 Pass-Thru Shelf with Overshelf     Price 24” WIDE Price $938 PA-24-24 $1055 24”     1151 PA-24-36 1158 36” 1253 PA-24-48 1565 48” 1349 PA-24-60 1685 60” 1396 PA-24-72 1804 72” 1444 PA-24-84 1973 84” 1495 PA-24-96 2111 96” 1558 PA-24-108 2123 108” 1588 PA-24-120 2150 120” 1732 PA-24-132 2348 132” 4 1973 PA-24-144 2519 144” 4 PA-18-60-2 PA-18-72-2 PA-18-84-2 PA-18-96-2 PA-18-108-2 PA-18-120-2 PA-18-132-2 PA-18-144-2 2717 2813 3051 3230 3429 3570 3822 4126 PA-24-60-2 PA-24-72-2 PA-24-84-2 PA-24-96-2 PA-24-108-2 PA-24-120-2 PA-24-132-2 PA-24-144-2 3491 3689 4124 4425 4681 4911 5168 5657     Mounting Brackets Included With Pass-Thru Shelving *2” x 4” - L Bracket **5” x 5” - Cantilever Bracket For 18” Wide Shelves For 24” Wide Shelves pASS-ThRu mOdiFiCATiON Includes Side & Top • Minimum Length = 36” Pass-Thru Frame Length Model Price 36” TA-84F-36 $1156 48” TA-84F-48 1283 60” TA-84F-60 1413 72” TA-84F-72 1512 84” TA-84F-84 1590 Print Required For Proper Location      Electrical Utility Chases • Conceals Wires • Removable Panel For Wire Access. • Wiring Available Upon Request. 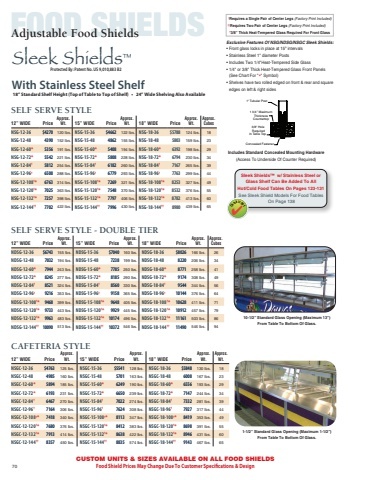 Available only for CU Series & OTS Series Shelving (Pages 68-69) Call For Wiring Installation! • Conceals Wires For Heat Lamps. • Required Installation Of Buyout Equipment Consult Factory for Wiring     70 70 FLOOR CHASE CEILING CHASE Print required for proper chase location. Utility Chase is FACTORY INSTALLATION only. PIPE CHASE MODEL UCC-1 UCF-1 FEED TYPE Ceiling Floor PRICE $1529 1350 MODEL PC-1 PRICE $600 ea.